Samsara’s Bizarro Series Cues feature a unique painting technique that was developed in house. Keeping to Samsara’s quality construction techniques and exacting standards, these cues are built on the same blank as any Samsara Cue. Bizarro Series are simply a radical take on the customary Samsara cue. backwards or inverted. That’s exactly why Bizarro was the perfect name for this new series. Samsara Cues is known for clean-cut, traditional, and elegant inlaid designs. The Bizarro series cues, however, are just the opposite. Wild colors, radical overlaid designs, and everything but traditional. Know that any Bizarro cue featured on our website and in our store is 100% unique and cannot be duplicated…So although the Bizarro Series cues are a completely different take on Samsara, rest assured that you will still be holding a one-of-a-kind Samsara Cue. 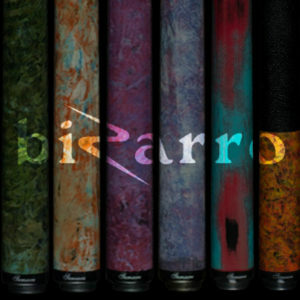 Check our Bizarro Series Cues out on the Samsara Online Store. Go ahead, take a walk on the wild side of Samsara Cues.